It’s late on a Friday morning and our vans from the university wind our way along backcountry roads covered with snow. It’s overcast, it’s about 20 degrees F, and the hunting cottage and surrounding buildings are set back in a pine forest. 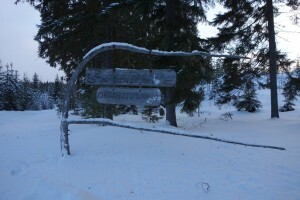 The sign is built from a snaggely old piece of flat wood and hangs on thin chains in a frame. 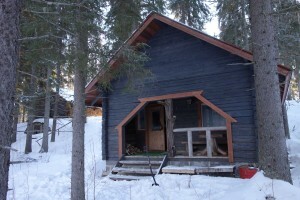 Alongside the building is a wood shed, a yert, a sauna and an outhouse. 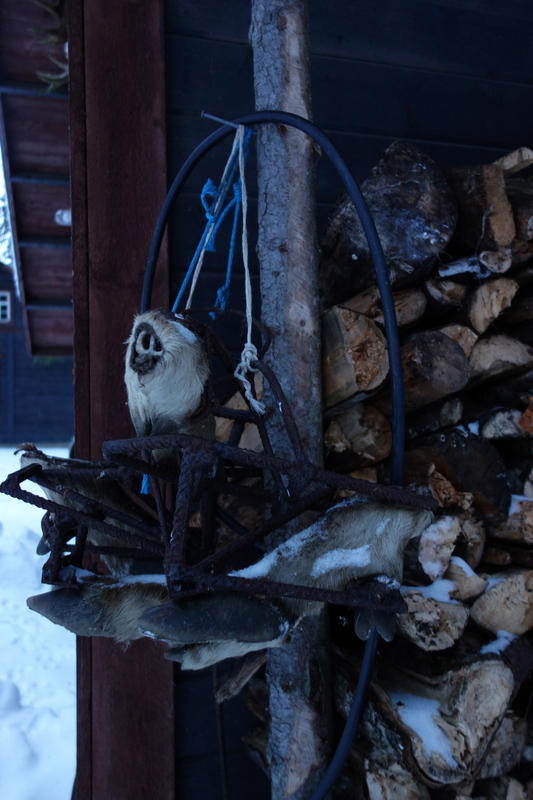 Hanging on the woodshed is a pair of deer hooves connected to a set of metal leggings that can be worn by humans – a trick, I suppose, to leave tracks in the woods as a practical joke. All buildings are made of locally hewn wood. From the outside it looks clean, well cared for, and welcoming. The hunting lodge includes a living room, a kitchen, and a bunkroom with two beds. At the end of the living room stands a wide and tall fireplace made of brick and around the room are benches and a few picnic tables. 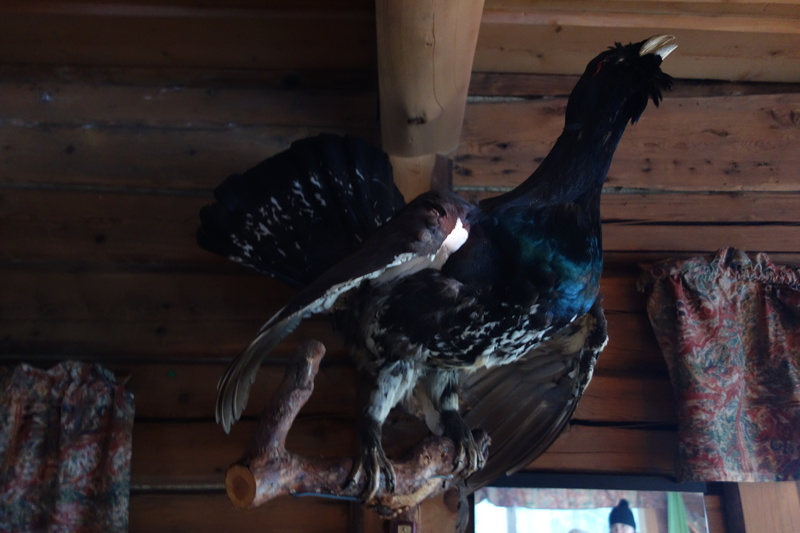 Stuffed grouse, lynx, and marmot hang in spooky, lifelike poses from the walls and ceiling and a stuffed wolf stares outward from the bunkroom, its mouth configured in a permanent, lip-curled snarl. Can you explain what’s going to happen when your students get (to the cottage)? We put our backpacks and sleeping bags on the floor and start to unpack—or so I think—but when I look up the room has emptied. All sixteen student teachers and the professor have gone outside to put on their snowshoes and cross-country skis. At the center of the group is Heikki, our expert biologist, talking about Finnish wildlife. (Somehow I missed the instructions in Finnish to go outside.) I throw on some extra clothes, run outside, and try to put on my own snowshoes, struggling with the fasteners. The best I can do is to get the latches connected but they’re still loose and floppy. I hope they’ll hold for the next few hours. 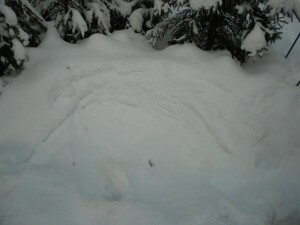 We start our trek into the forest and Heikki points out adult and juvenile moose tracks, shrew tracks, martens and mice. 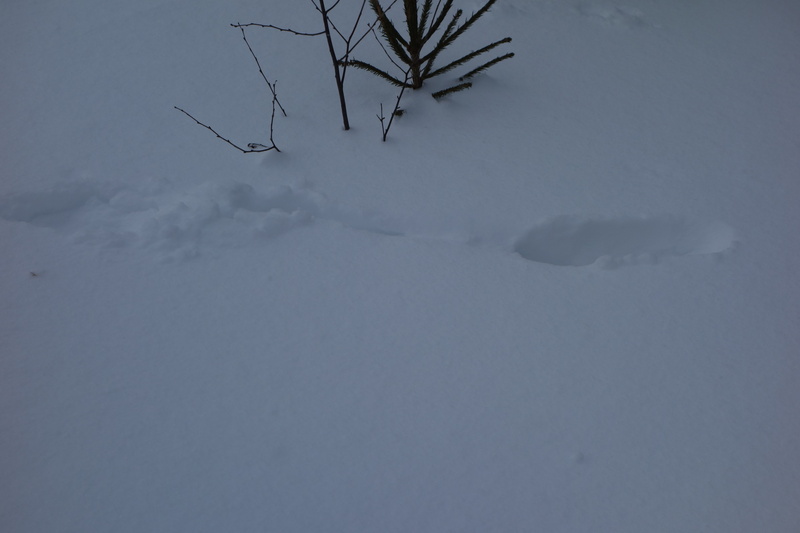 He also points out a softball-sized hole in the snow where a grouse dove into the snow for the night and a hole right next to it where the grouse flew out in the morning. The snow is soft, delicate and dry, and the consistency looks almost like velvet. It is simply perfect. On the trail we pass an oval-shaped compression where a moose bed down for the night and not too far away is another bed that also includes moose droppings. (I didn’t know that moose droppings look very similar to what might be left by a very, very large rabbit.) There aren’t any freeway sounds, neighborhood noises, or airplanes—only skis and snowshoes trekking through the forest and an occasional Finnish conversation. N-o-t-h-i-n-g else! All the sounds are being absorbed into the surrounding trees and snow. A student teacher scrambles to stand on his friend’s shoulders trying to reach the top of the tree but his boots slide off and both men tip over, laughing and sprawled out in the surroundings. One of these men also tries to ski down a fallen tree but that doesn’t work, either. This feeling of camaraderie reminds me of an undergraduate class I took at Middlebury College at High Pond drainage basin. My classmates and I took turns in four-hour shifts taking scientific measurements of water samples to determine the pond’s chemistry and measure the clarity of the water. During the day and night small groups of us would start up the pick-up truck and head down the dirt road from the house to the pond, take a rowboat to the middle of the pond and take water samplings. At night and in almost complete darkness, we’d lower the black and white secchi disk over the side of the rowboat into the water as far as we possibly could until the flashlight no longer reflected off the black and white disk. There were owl and woodpecker calls but there were also sounds of things we didn’t recognize like screeches! And of course it didn’t help when guys would jump out when we were walking through the woods! But on the warm afternoons it was heavenly. We’d sit along the side of the pond eating lunch in the sunshine and enjoying the feeling of nature, until the guys yelled and screamed from just around the corner, jumping buck- naked into the water. We don’t see any dangerous predators (but maybe they see us) and my snowshoes stay on for nearly the entire journey. The sun casts the forest in long, eerie shadows and the temperature drops. 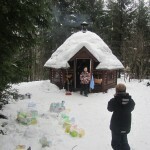 A few go down to fire up the sauna and others collect snow and melt it for bathing in the sauna. Others stoke the fire, which we plan to do at half hour intervals throughout the night. The rest of us work to identify animal tracks by flashlight. Soon, women will be parading down to the sauna, and then followed by the men, and others won’t go at all. (The Finns are more concerned about the abundance of sticks and needles in their bath water than they are about bathing naked in the sauna together.) In the middle of the night the flu stops working, the room fills with smoke, and we spend the rest of the night keeping the fire at a low burn and the doors ajar to allow the circulation of fresh air. In the morning we’re asked to design a lesson that connects future students with the natural environment. After collaborating, one group digs a hole in the snow and puts their faces into that hole to look at the ground and find out what has survived. Another group bounds across the snow using their feet, their hands and feet, and crawling on hands and knees. They’re making animal tracks and there isn’t a lesson plan in sight. 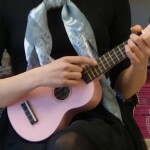 Watching this unfold is a key lesson from the Finns – that teachers are given a target and they have to process what that educational target means, both in student interest and connection with the surroundings. The teachers’ focus is to connect students with the curricular objective and then make the students solve problems in order to reach it. There are many ways to reach the educational objective. The focus is not on the outcome, it’s on what happens during the learning process and how the students solve the problem. Everyone learns. Everyone solves problems. Everyone gains. There are no multiple choice or true false tests because those results limit the learning and they limit what students need to accomplish in order to show mastery. The assessment is what the students accomplish during the learning process. Actual grades are infrequently given and there are no online grading programs. The teacher’s work is to guide, to nurture, and to coach student learning as they process the objective and solve problems. If the teacher wants to test, it’s usually in the form of an essay or performance based test.